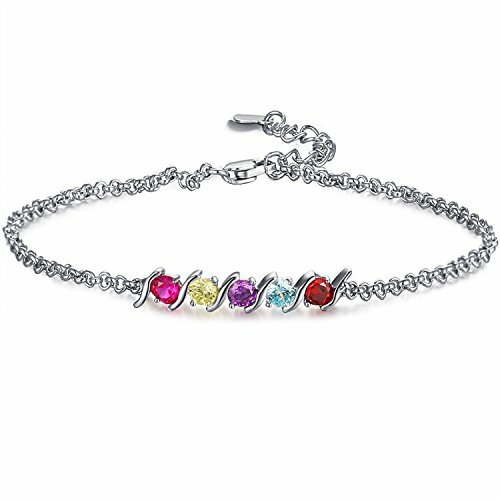 This Caperci Sterling Silver Cubic Zirconia Tennis Bracelet accents 5-color lab-created round or heart-shaped gemstones organized in order and robust rolo chain with spring clasp. It's a must-have for your fashion bracelet collection or a special gift for your beloved girl. Comes with a nice jewelry gift box, no doubt it is a perfect gift for her - girlfriend, wife, mother, daughter, sister or friend on Valentine's Day, birthday, Christmas, anniversary, Mother's Day or any other special day!